6 Atherosclerosis of the heart aorta - what to do? Atherosclerosis occurs from the Greek athero (porridge or paste) and sclerosis (hardening). 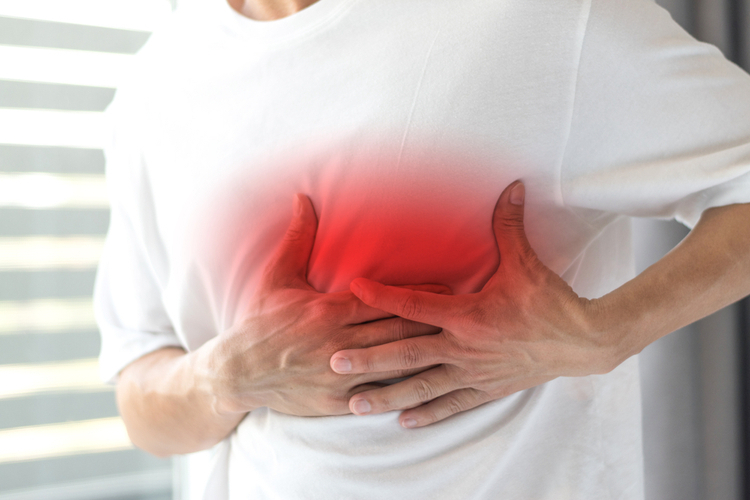 Atherosclerosis occurs as a result of a complicated process based on the deposition of lipids, damage to the arteries and inflammation of the vascular wall. This process leads to an abnormal thickening of the arterial wall and the development of atherosclerotic plaque. 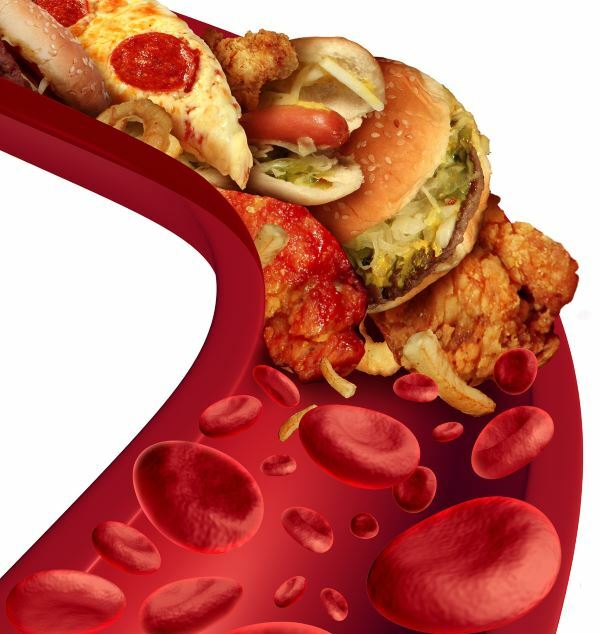 Clinical manifestations of atherosclerosis are well known and include ischemic heart disease, cerebrovascular diseases and peripheral artery disease. Different methods are used to diagnose atherosclerosis of the heart's aorta, but the most informative is ultrasound of the heart and adjacent large vessels, in combination with angiography. When confirming the diagnosis, treatment is prescribed, which prevents the development of serious complications in the form of stroke and myocardial infarction. 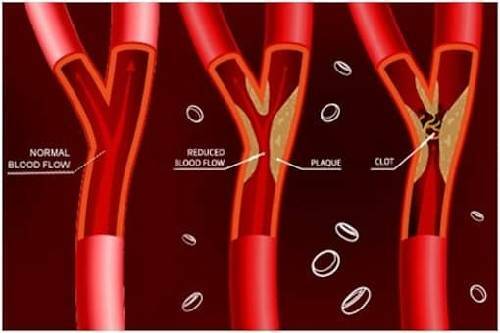 Atherosclerosis of the heart means that atherosclerotic plaque is formed on the inner wall of a large blood vessel, which consists mainly of fat-like substances and calcium. Such pathological accumulation often leads to so-called solidification of the arteries. Aorta is the main artery in the human body, since oxygen-rich blood flows from the heart to all parts of the body and brain. In normal condition, the blood runs from the heart through the abdomen (abdominal aorta) and further through other vessels of smaller caliber. Atherosclerotic accumulation may weaken the aortic wall . As a result, the affected area of ​​the vessel can stretch or break, that is, develops aneurysm or bundle of the vessel. 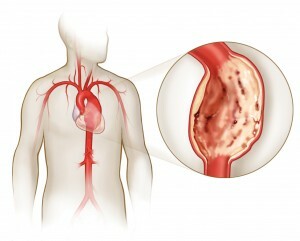 A part of the atherosclerotic plaque can be disconnected from the wall of the vessel, which leads to thrombosis or thromboembolism. A blood clot or part of the plaque can move around the body and block blood supply to one or another part of the body. Though two complications have similar risk factors, thromboembolism occurs much more frequently (in about 12% of cases in patients with severe abdominal atherosclerosis) than athero- embolism (defined in 1% of cases or less). Smoking (both active and passive). Dyslipidemia is high cholesterol, LDL. Also, the ionizing irradiation of the blood vessel may be significant, which contributes to damage to its wall and the formation of an atherosclerotic plaque. 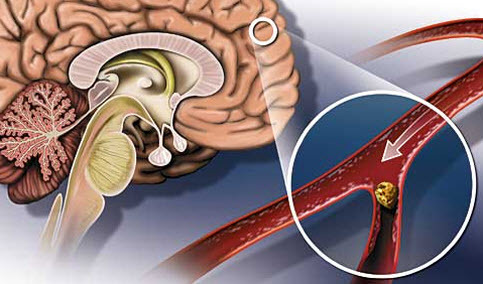 Stroke - this complication can happen when a clot of blood falls into the brain and blocks blood flow. Without blood, portable oxygen, this part of the brain begins to die. Aortic aneurysm is convexity in the wall of the aorta, which may burst, that is, tear apart, causing severe bleeding. Fusion of the aorta is a gap between the inner and outer layers of the aortic wall. Fusion can lead to the separation and rupture of parts of the aortic wall. Such a pathology often leads to serious bleeding. Limb ischemia - this means that the limb, usually the leg, does not get enough oxygen. A similar occurs when a blood clot overlies the blood supply of the leg, resulting in the death of soft tissues. In the beginning, the disease does not manifest itself, since the atherosclerotic plaque does not disturb blood circulation.Also, the wall of the vessel may not be damaged enough to cause clinical manifestations. The nature of the symptoms depends more on the location of the atherosclerotic plaque. For example, some of the symptoms are determined by the defeat of the abdominal aorta, and the other - with the defeat of the arc of the aorta. Anatomically, the aorta is divided into an ascending part, an arc and a descending part. At the same time, the latter part is subdivided into two more divisions - chest and abdominal. Another unsafe location of the atherosclerotic plaque is bifurcation of the aorta, where the large vessel is divided into two iliac arteries, which are directed to the right and left legs. Burning pain behind the sternum or painful pressure. Distribution of pain in the arm, neck, left shoulder blade or spine. Blood pressure may increase or decrease, but hypertension is most often observed. Consciousness may become blurred, or the patient at all fails. Disorders of digestion, which is most often expressed by constipation, diarrhea, flatulence. Appearance of abdominal pain from weak to severe and extremely pronounced. In some cases, patients complain of weight loss or weak muscles, which indicates a decrease in muscle tone. It may also be marked by voiding or difficulty swallowing. Numbness in the lower extremities. Feeling cold in the legs. Changes in skin color, for example, in cyanotic or crimson shades. Weakening of potency in male patients. In severe cases, when the blood supply is significantly disturbed, trophic ulcers appear on the lower extremities. With a constant lack of blood, the patient develops a gangrene, which ends with amputation of the limb. Visualization methods for evaluation of atherosclerotic plaque include transesophageal echocardiography (PC echocardiography), computed tomography (CT) and magnetic resonance imaging (MRI). The major anomalies of the aorta are also found, if necessary, with contrast angiography and transthoracic echocardiography (TT echocardiography), but these methods have significant contraindications for contraindications. Contrast angiography is invasive, requires the administration of a contrast agent and the application of radiation.In addition, it often does not clearly map the deposits of the plaque, because it does not provide an accurate picture of the aorta wall. TT echocardiography is most often used to visualize the root of the aorta, the proximal ascending part of the aorta, the part of the arch of the aorta, and the descending aorta. However, the sensitivity of this method is limited, because the resolution is not sufficient for reliable measurement of the thickness of the plaque. 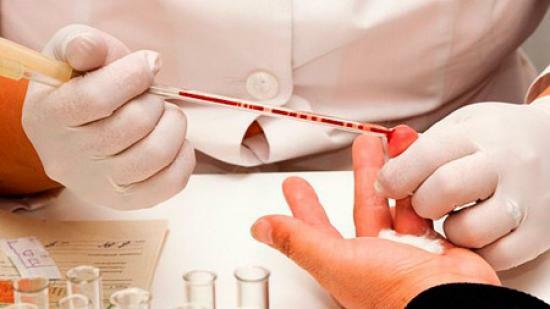 Additionally, laboratory tests are conducted to help determine cholesterol, LDL, and so on. Aortic atherosclerosis can be treated with changes in lifestyle and medications that help reduce the risk of serious complications. Drugs for treating arterial pressure , such as ACE inhibitors (angiotensin converting enzyme), ARI (angiotensin II receptor blockers), and beta-blockers. 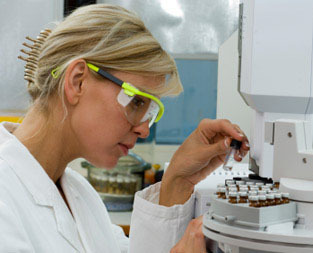 Drugs for lowering cholesterol , such as statins and other similar medicines. Drugs that prevent blood clots such as aspirin. These drugs slow down the development of blood clots that can cause a heart attack. It is necessary to take the medicine correctly, that is, according to the medical recommendations. Call your doctor or nurse if there are any suspicions that side effects have occurred. If blood diluents are taken, it is imperative to get acquainted with how safe it is to take the medicine. In particular, anticoagulants can cause serious complications in the form of bleeding. 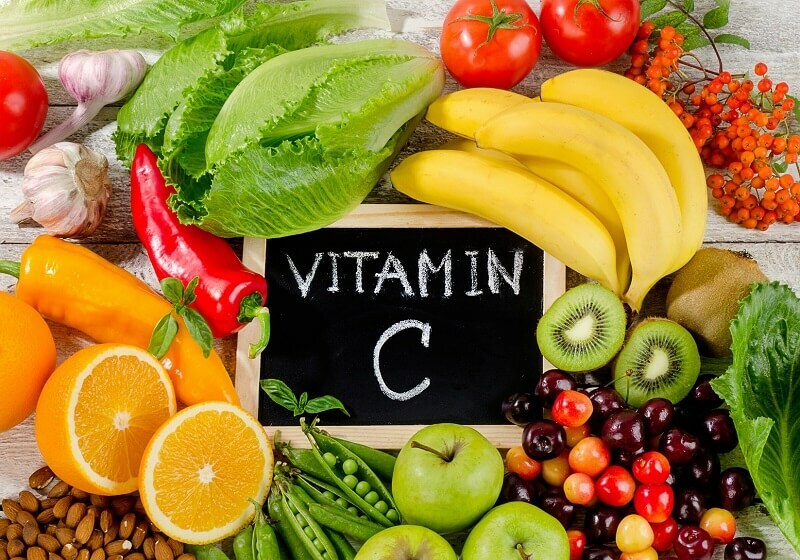 You should not take any vitamins, over-the-counter medications or herbal products without first consulting your doctor. In addition to medicines, if necessary, folk remedies can be used, which allow with minimal harm to the body to noticeably strengthen the vessels and reduce the amount of cholesterol and other fats in the blood. 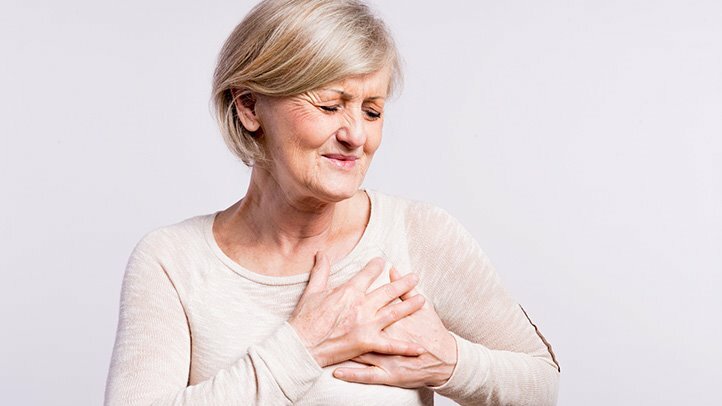 In particular, for the elimination of atherosclerosis of the aorta of the heart is used astragalus, bilberries, calendula, lemon balm, dill, pyrethrum, maiden, garlic, ginkgo, chamomile. 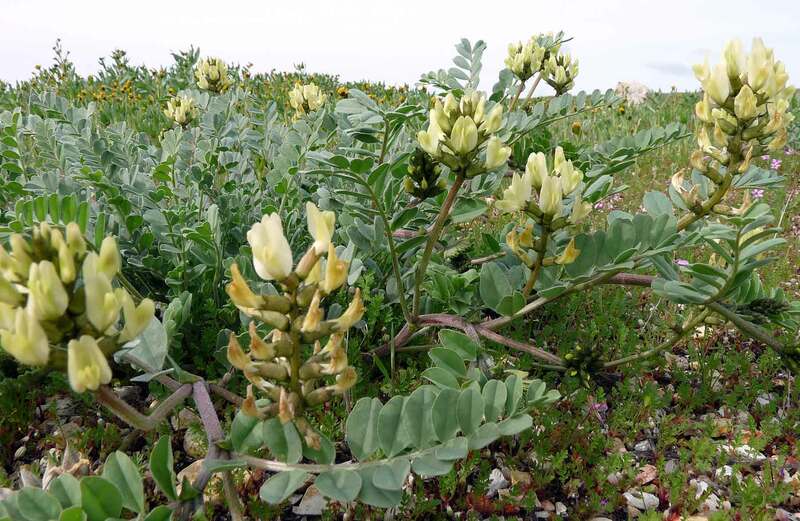 Astragalus is being studied in the treatment of atherosclerosis, hyperthyroidism, hypertension, insomnia, type 2 diabetes, genital herpes and AIDS. It is also used to increase the effectiveness of cancer chemotherapy and reduce its side effects. Blueberries are rich in antioxidants, which concentrate in the skin of the berries and give it a blue color. But also the well known blueberry Vaccinium myrtillus, which is completely dark and is very useful for health. The broth contains anthocyanosides, antioxidants, which are believed to strengthen the walls of the blood vessels, improve blood circulation, prevent the formation of blood clots and prevent damage from free radicals. Blueberries are highly prized in European medicine for centuries, especially as a medicine for promoting night vision.Experts suspect that blueberry anthocyanidins may increase the production of rhodopsin, a pigment that helps the eye adapt to various changes. There is a recipe for the preparation of balsam from flower heads, which are immersed in olive, almond or coconut oil for two weeks, and then add to the mixture of beeswax to thicken. This remedy stimulates the regeneration of the upper layer of the skin, resulting in the grass being useful for superficial wounds, sunburns and cracked lips. 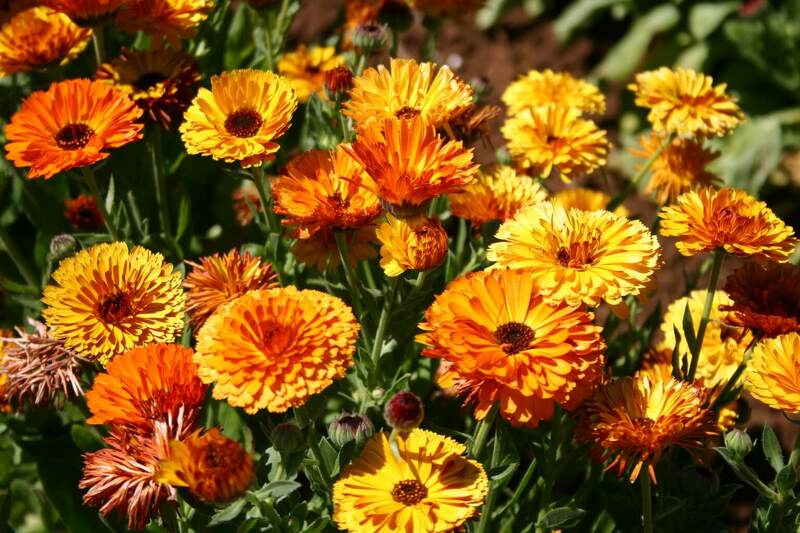 Lycopene-rich petals of calendula can also be thrown in salads or dried for tea, which calms the irritated stomach and sore throat. Additionally, it removes inflammation in the vessels, which prevents the development of atherosclerosis. Melissa officinalis, a member of the mint family, has many common names, including the delight of the heart and the honey plant. The name Melissa means "bee", and studies have shown that the plant contains several compounds found in the gland of the Nason working bees. They help bees report the food sources and the location of the hive (according to the American Society of Herbs). Lemon balm, used locally, can reduce symptoms of herpes simplex virus. It is also used as a remedy for anxiety, dyspepsia, and irritable bowel syndrome. Removes vascular inflammation and prevents progression of atherosclerosis.If necessary, it is used as a tonic for seasonal affective disorders. In particular, the remedy helps with dysthymia, which is a depression of a weak degree. Most often you are advised to brew three or four stalks of grass in a hot water cup and drink in the form of infusion. According to the American Society of Herbs, dill seeds were called "seeds of the assembly house" because they were chewed during long church services, so that members of the church did not sleep or the children were silent. The seeds were also chewed to refresh the breath and calm the agitated stomach. Modern studies have shown that dill can also lower cholesterol levels. Cultivation of this herb in the garden or in the garden gives an additional advantage in the form of attracting useful butterflies. Tanacetum parthenium has a mixed story. The Medical Center of New York University in Langon suggests that the name is a distortion of the older definition of the type of pen foil. This grass has lost its popularity with herbalists, because it does not relieve the fever. The grass returned to fashion in the 1970s, when the wife of a British medical worker tried the local folk remedy - chewing the leaves of pyrethrum - from her terrible headaches and migraines. The success of this medium has attracted the attention of researchers who have been trapped by clinical trials and found that chewing the fresh leaves of the pyrethrum during migraine really helps people to feel better. They also found that daily dry capsule receptions may reduce general susceptibility to headaches and slow down the progression of atherosclerosis. For centuries, people have used garlic to prevent infection and treat many diseases, including breathing problems, leprosy, type 2 diabetes and warts. Scientific research has confirmed the usefulness of the plant by finding that garlic reduces blood pressure and can protect against heart attack and stroke. Studies also show that regular consumption of cooked or raw garlic may also reduce the risk of colorectal cancer. Garlic is one of the favorite herbs of Mark Blumenthal. "Garlic is food?" Vegetable? Spice Medicine? Probably all of the above, "he says. The ginkgo biloba, with its fan-like leaves, is the oldest of the surviving species of trees. It was destroyed during the Ice Age in Europe, but continues to flourish today and is increasingly respected for medicinal properties in Asian countries. Ginkgo is currently one of the best-selling herbal supplements in the United States. These additives are made from wood leaves containing antioxidants that are believed to protect nerve cells, cardiac muscle, blood vessels and retina from various damaging factors. 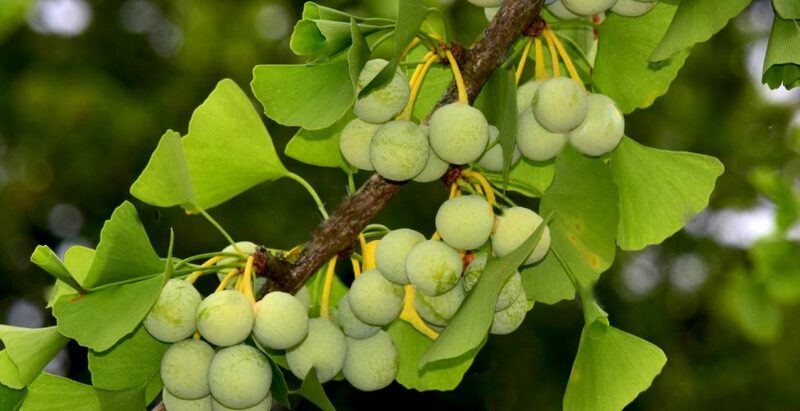 Ginkgo has been shown to improve memory in people with dementia, mitigates the side effects of drugs used to treat schizophrenia, and reduces anxiety. As ginkgo dilates the blood vessels, it improves blood circulation and increases the distance that people with peripheral artery occlusion can walk painlessly. 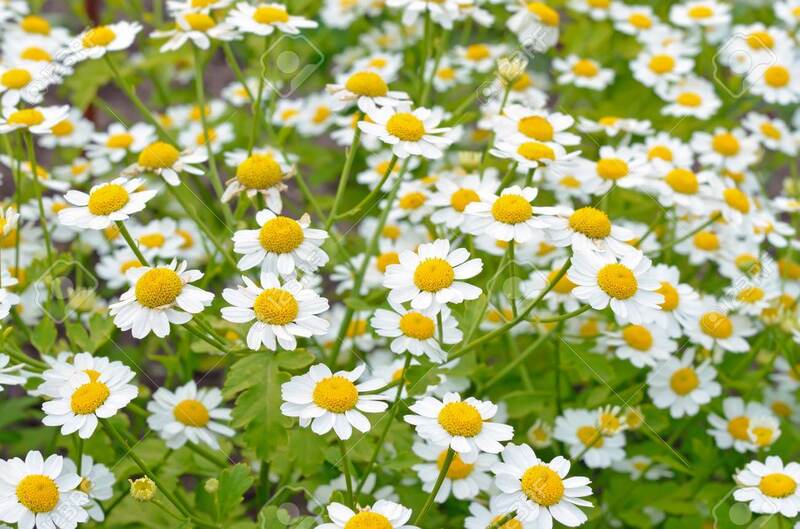 The German chamomile (Matricaria recutita) and English chamomile (Chamaemelum nobile) have been used in medicine for many years with digestive disorders, skin irritation, anxiety and as a means of improving sleep. Although not all of these applications have been tested by science, one study found that chamomile is useful in mild and moderate anxiety. Also, the correct use of chamomile can improve the condition of the vessels, which in turn prevents the development of atherosclerosis. Atherosclerosis of the heart aorta - what to do? You need to give up smoking. If you need help stopping your bad habit, talk to your doctor about smoking cessation programs and medication. This can increase the chances of reducing the risk associated with atherosclerosis. It is important to have useful products for the heart . First of all, it is fruits, vegetables, whole grains, fish, low-fat meat, as well as low-fat dairy products. It is necessary to limit sodium (table salt), sugar and alcohol. Weights should be maintained within normal limits . 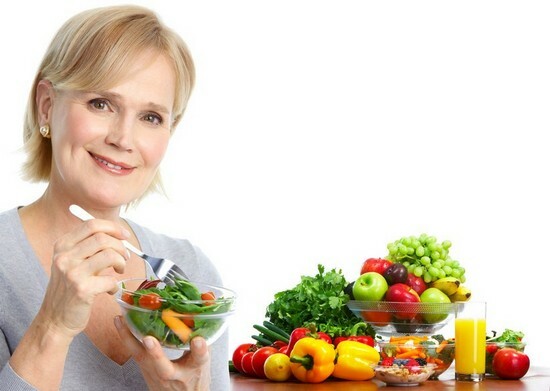 If necessary, you need to lose weight with the help of a suitable diet. If your doctor recommends normalizing your physical activity, you need to do more exercises. Walking is a good choice.Gradually you need to increase the amount of daily walks. It is important to try to engage in moderate or energetic activity, at least 2.5 hours a week. It's good to be active for 10 or more minutes during the day and week. It is important to avoid people with colds and flu. If necessary, you need to make a vaccine against pneumococcal infection. You should also be vaccinated against influenza every year. If you have to be among people with a cold or flu, you should often wash your hands. It is important to learn how to manage other health problems, such as diabetes mellitus, thyroid disease. If high blood pressure is determined, it is very important to monitor your blood pressure and take appropriate medications to lower it. The implementation of medical recommendations is a key part of the treatment of cardiac aortic atherosclerosis and concomitant diseases. Be sure to sign up for all required consultations and call your doctor or nurse if any health problems are identified. It is also useful to know the results of analyzes and studies and keep a list of medications that are prescribed for admission. 3. Крайдашенко О.В. та ін. Фармакотерапія. Видання 2-ге: Підручник для фармфакультетів ВМНЗ, 2013. The human brain is supplied with blood through a network of arteries. 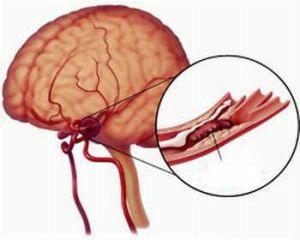 When blood vessels are blocked by pathological formations, then they speak of atherosclerosis of the vessels of the brain. Similar sediments consist of triglycerides, cholesterol and other substances. They limit the access of blood to brain cells and increase the risk of stroke.